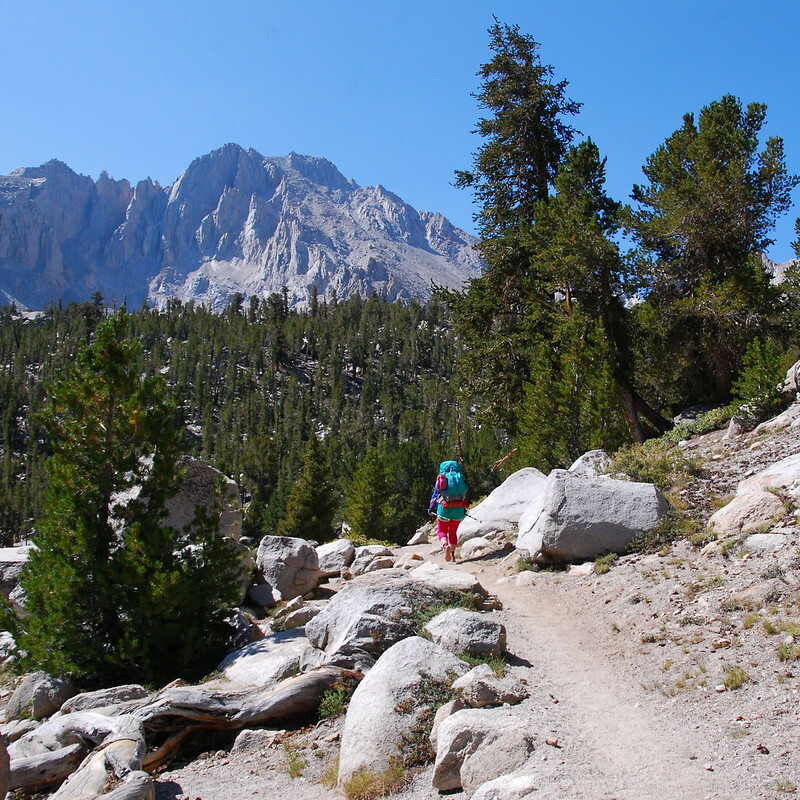 JMT, Day 7: Together – Hi, Alpine. We sleep hard in the soft bed at the Williamson Motel, then wake up to a breakfast of bacon, eggs, English muffins, and a few gallons of coffee, served at a big kitchen table in an empty room. There are a bunch of other hikers here, and a few tourists just passing through. As we walk in, everyone says hello. It’s weirdly intimate, but also somehow comfortable. There’s a well-dressed man in his early 50s cooking in the kitchen, on the same temperamental stove that’s in our room. He emerges every few minutes with more plates of food, or to refill coffee. Strider acts as a sort of conversation facilitator. 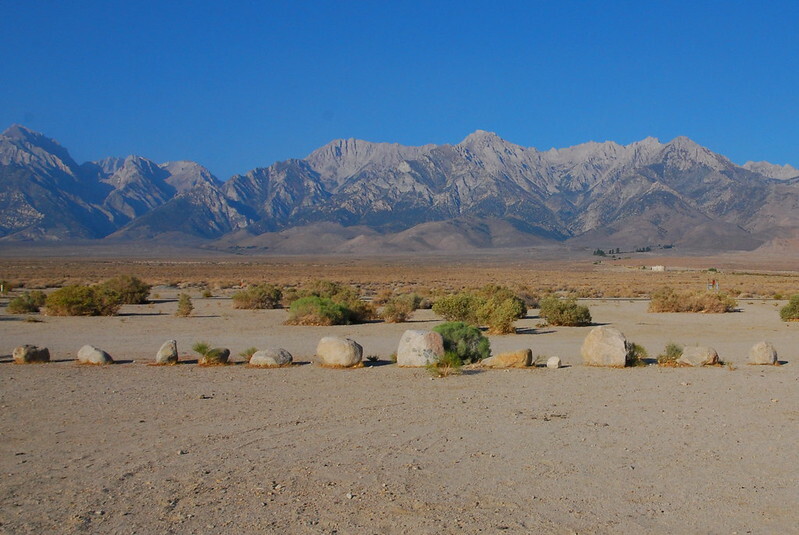 One dude, an Irish Catholic guy from Massachusetts, has been on the JMT southbound, but came down for mass (!). He’s dropping out now because the smoke is aggravating is asthma, and he gives us what’s left of his coffee supply – a packet of freeze dried stuff from South Korea, which apparently also includes sugar and freeze dried cream. A surprising proportion of all our conversations have to do with coffee. After breakfast, we meet Strider at her new black SUV, and she gives us a ride back up to the Onion Valley Trailhead. We stop for gas in Independence, and see Paul, the guy who gave us a ride to Horseshoe Meadows a week ago, sitting in his car, eating an icecream sandwich. It’s 8:30 in the morning. Switchbacking up toward the trailhead, we pass the sheriff. Strider knows his name. I suspect everyone does. “What was he doing up there?” We find out a few minutes later, as we pass a truck carrying the remnants of a destroyed passenger car. The front’s just… gone. Pushed into the windshield. There’s what looks sickeningly like blood on the driver side window. After a few more minutes, we pass the scene: a curve in the road, and a few dislodged rocks in the roadside embankment. If it weren’t for the orange cones and twisted metal, you’d never guess that anything had happened here. Strider drops us off at the trailhead just after nine, asking if she can take our picture for their website. 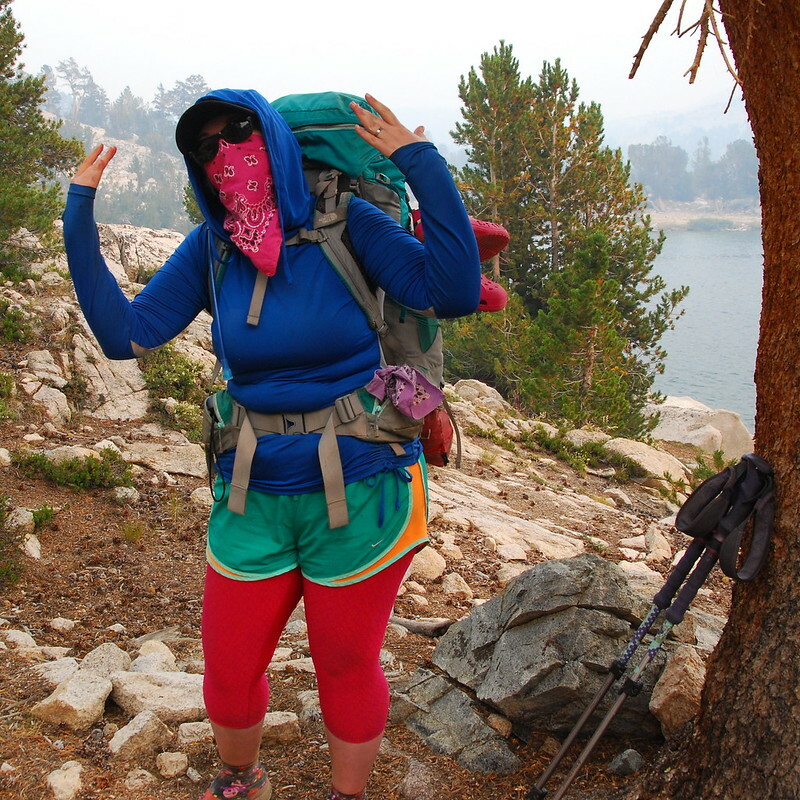 We pose awkwardly – nervous, I think, to get back on the trail – futz with our packs for a while, and set out again. We won’t see another road for two weeks. 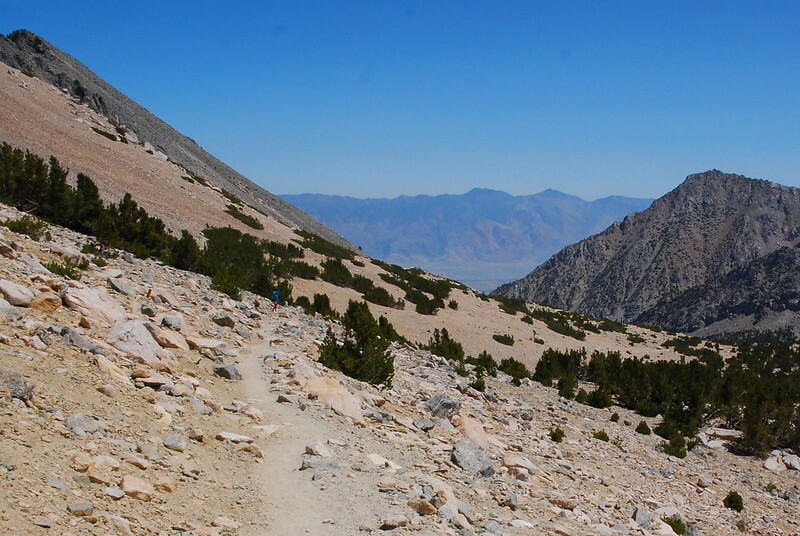 We’ve been a little nervous about the trail up – it seemed so long on the way down! – but it passes quickly. Just after Gilbert Lake, we run into a couple northbound guys, who drove over from Sacramento this morning. Or: “morning.” They left at something like two last night, and drove all night to get to the ranger station when it opened. They’re tired and feeling the elevation. I understand. It makes me grateful to be somewhat acclimated. We’re struggling up a steep section of trail when suddenly our peakbagging friend from the other day is standing on a rock ledge a few feet above us. “Hello!” His voice booms down the valley. We say our goodbyes, and, as we’re leaving, he yells back to us: “How are you for food? Do you want some freeze dried scrambled eggs?” We don’t – the idea’s actually a little horrifying – but thank him all the same. 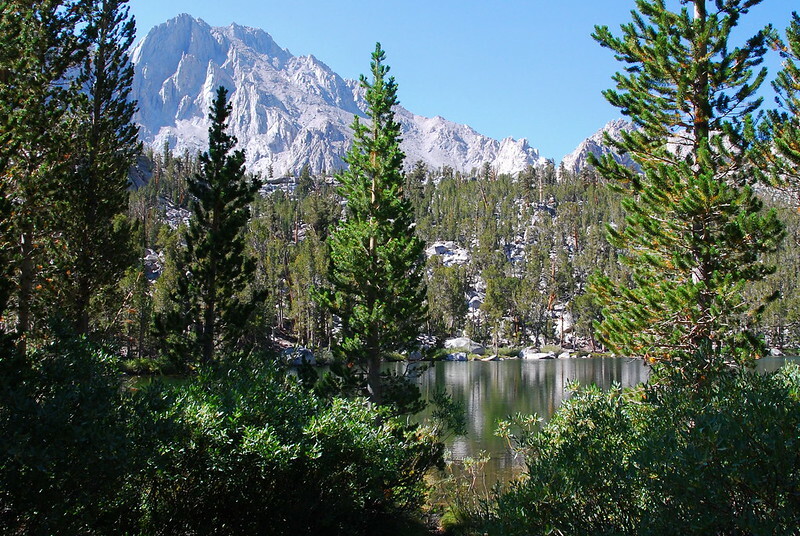 After the pass, we have lunch and filter some water at Bullfrog Lake, then continue on to the JMT. As we descend west, the smoke gets worse and worse. Krista, as ever, is prepared with an impeccable outfit halfway between Rainbow Brite and early 90s gangster rap. As we veer north toward Glen Pass, the smoke thickens. It’s the worse we’ll have all trip. And we both begin to have trouble breathing. My eyes burn. Krista had asthma as a kid, and the smoke’s bringing it back. She says she can’t get enough air when we go uphill. We slow way down, to less than a mile an hour. We stop every fifty feet to check in. I listen to her breathing – it’s ragged and shallow, rushed and uneven. We walk close together, and I listen carefully. The smoke’s shuttered out all sound; all I can hear is Krista’s faltering breath. I don’t scare easily out here – I grew up doing this stuff, maybe I should be scared more often – but I’m scared here. Really scared. I just want it to be okay, but I have absolutely no idea how to make it that way. As ever, Krista’s braver than I am. “Let’s just keep going.” We stammer on through the gathering smoke. 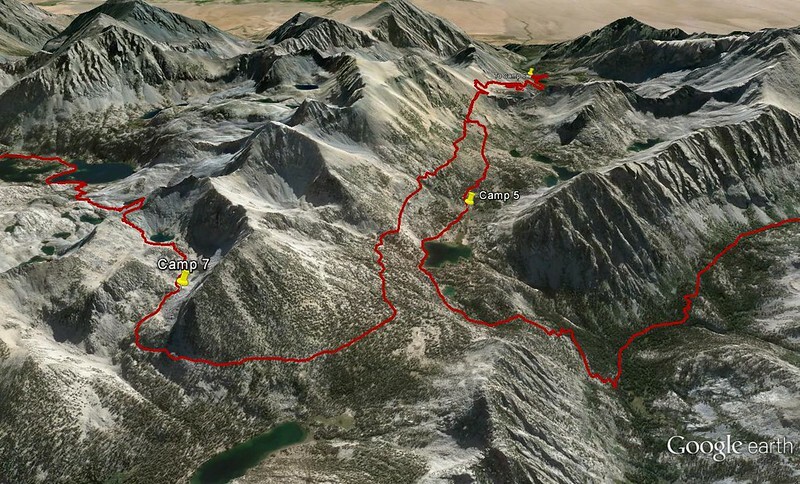 Our map shows a couple ponds just beneath Glen Pass, but they’re not coming. Everything seems dry. We find a flat spot cut into the hillside – too small for our tent, but big enough to bivy, if it comes to that – and stash our packs there while I walk up a little further to see if there’s anything better. I find a sheltered spot maybe a quarter mile up. It’s dry, but flat, and big enough for our tent. It’s a strange moment of levity in the middle of a really hard afternoon. We both laugh. We both needed to laugh. Nature as teacher. On the drive up from Independence this morning, talking about the smoke, Strider said that she thought it would be worse for people hiking alone. “At least you have each other.” We can lean on each other. I don’t know what it would be like to be going through this alone. I think about that as I look through our map, trying to figure out a way to make it better. If we’re going to leave, there’s a lateral trail just north of Glen Pass that we can take back into Independence. At least then we can avoid going over Kearsarge a third time. It might mean thirteen miles of road walking, but that’s okay. On the road, we can walk side by side, chat, maybe even hold hands. I can’t really sleep, but I lie down on my back all the same, put some music on my headphones. Krista grabs my hand, and, eventually, we fall into a fitful sleep like that. Together, whatever may come. 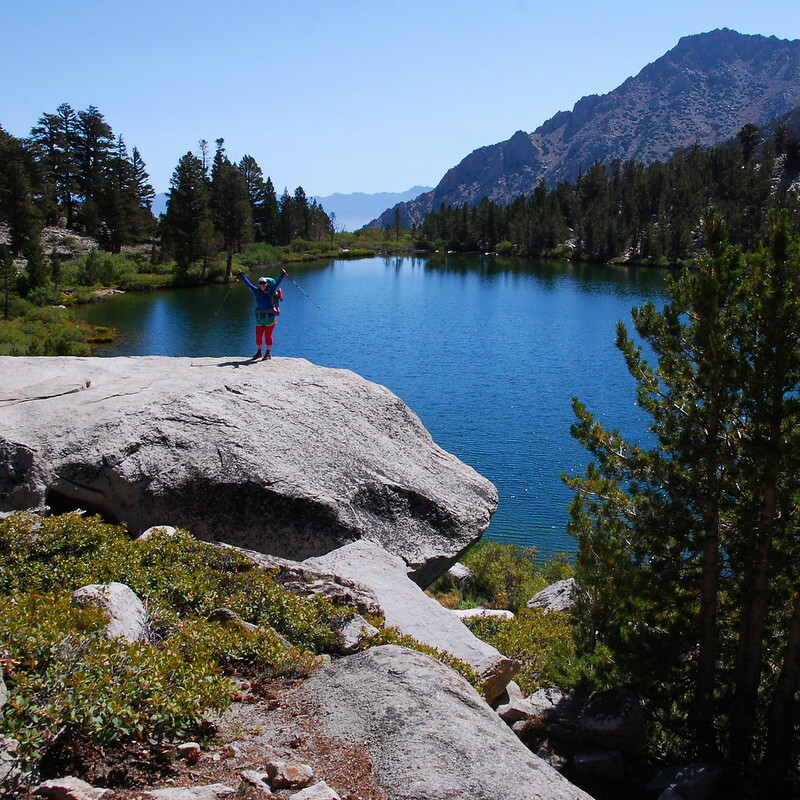 Pingback: Back to the Sierra, Day 1: Together, Pt. 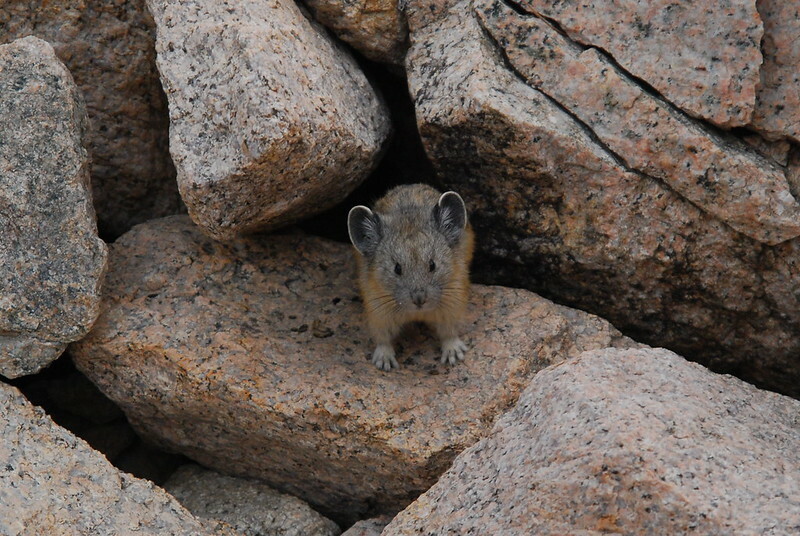 2 – Hi, Alpine. 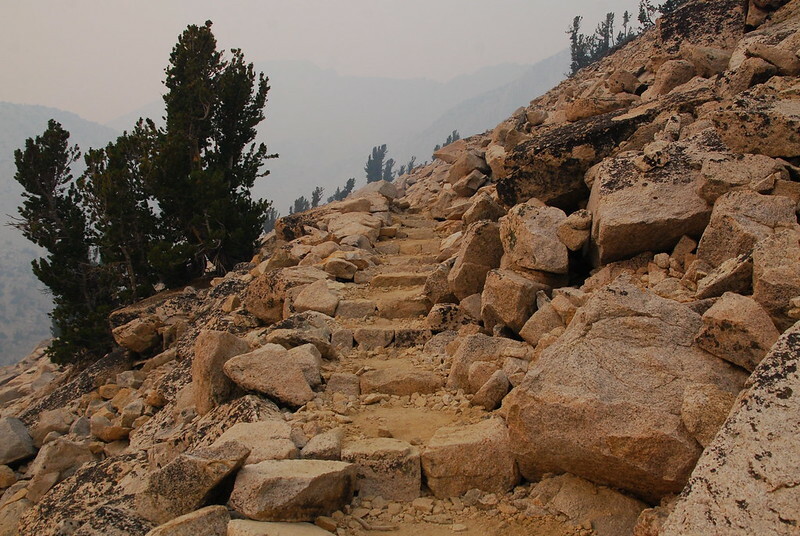 Pingback: Tuolumne to Tahoe, Day 0: Getting There – Hi, Alpine.